Any new film from Takashi Miike is something to be celebrated. While you usually use that sentence in connection with a director who produces a film a couple times a decade, Miike is the definition of prolific. Blade of the Immortal is Miike’s 100th movie and his 3rd chanbara (“sword fighting) film. Based on the long running manga by Hiroaki Samura, Miike’s take on the source material is frenetic, fascinating and wonderful, truly befitting his century of films. Blade of the Immortal opens with our titular Immortal, Manji (Takuya Kimura), in black and white mortal days making a decision that leads to the death of his sister at the hands of bounty hunters. The ensuing battle of Manji versus the bounty hunters is incredible, blades flying, body parts and viscera cascading across the screen as Manji fights his way towards his sister’s killer. Manji’s sword mastery is such that he makes good progress but as tiredness seeps in, his wounds begin to mount, deep cuts to his face and losing a hand doesn’t stop his vengeance. As he lays there dying, a veiled woman of vast years offers him immortality empowered by scared bloodworms. Manji agrees and as his wounds bind together, Manji screams and vivid colour bleeds into the screen. We then jump forward 50 years. The main plot of the film follows Rin (Hana Sugisaki, who also plays Manji’s sister Machi). 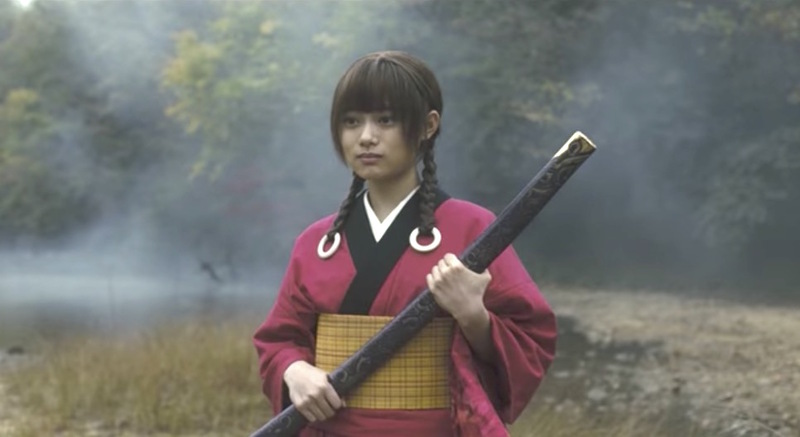 The daughter of a master swordsman, who trains with the men in her father’s dojo, she is trying to break the mould of the life expected of her. The dojo is infiltrated by Master Anotsu (Sota Fukushi) and his group of mixed skill warriors, the Ittu-Ryu. Anotsu believes in overthrowing the classical old schools of traditional Japanese martial arts and fusing them into a new world where all styles can uphold the Shogunate. The irony for Rin is that this is just what she wants, but it comes to her door at night, kills her father and steals away her mother to a fate far worse, it is in a way she had never dreamt of. Two years later, Rin is nudged towards Manji by the old woman and the journey they take together towards Rin’s vengeance (something which is within period law) is begun. Manji struggles with the situation as he sees his torment over Machi’s death in Rin and worries that his actions will lead to the same fate. He tries to train Rin, while Rin is tormented by the followers of Anotsu. This leads to a series of showdowns between Manji and various Ittu-Ryu henchmen and, most memorably, henchwomen. Erika Toda’s Makie is the highlight of the battles Manji faces, with him literally being taken apart by his beautiful opponent. Each of these encounters gives a glimpse into Manji’s burden of not dying and Anotsu’s crusade for a semblance of equality in feudal Japan. And all of this is just the main plot. The film is booked ended with two incredible battles which rate up there with the classics of the genre. The final one had me happily comparing it to the Army Battle in Lone Wolf and Cup: Baby Cart to Hades. But, as wonderful as all the mad action is, again it is moments when Miike allows his camera to stop and to linger that gives the film it’s heart. The confidence Miike has to do this is a hallmark of all of his films. In Audition, he leaves his camera on Asami as she dished out her revenge upon Shigeharu and, by extension, us in our complicity with his actions. In his sublime remake of Kobayashi’s Harakiri, he focuses on Motome’s eyes as he carries out his wooden seppuku. Later on he uses the same technique to so show the growing desperation of the family by their ever decreasing library. In Blade of the Immortal, Miike and cinematographer Nobuyasu Kita (whom Miike also collaborated on 13 Assassins and Harakiri) compose a shot in Rin’s father's dojo. Rin’s father lays dead in a pool of his own blood. Rin kneels by him and we just watch her silent agony. The shot felt like it went on for a half hour, your heart screams in sympathy for Rin and perfectly sets up what is to follow. Blade of the Immortal, like all of Miike’s work, is not for the faint of heart. Miike, at the London Film Festival screening I attended, said that he was happy we all stayed to the end, which doesn’t always happen with his films. I couldn't have left, I was transfixed by not only the carnage I was witnessing, but the genuine (metaphorical) heart that was shown on screen (though I’m sure someone had their heart opened up at some point), not only with our heroes, but the well formed main villains. Blade of the Immortal is released in the UK on 24th November 2017 and is rated 18.